Fruit glaze is a sugar-based gelatinous mixture. Adding a fruit glaze to your fruits makes them more shiny and appealing, in addition to adding sweetness. 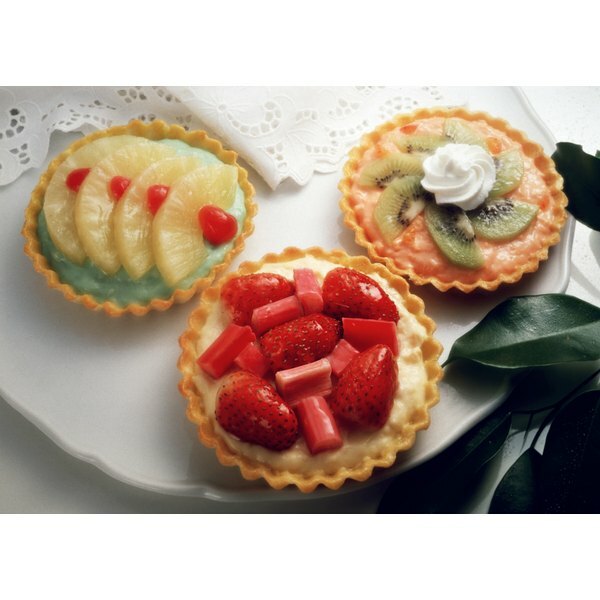 Fruit glaze is commonly used in desserts, such as fruit tarts or fruit-topped pies, but can also be used when serving fruit alone. You can easily create a fruit glaze at home with just a few ingredients to give your desserts a more professional look and taste. Mix 1/2 cup of sugar and 1/2 cup of fruit juice in medium saucepan and bring to a boil. Any kind of fruit juice is suitable for use. However, keep in mind that the color and flavor of fruit juice that you use will carry over into the look and taste of your glaze. Mix 2 tbsp. of cornstarch into the other 1/2 cup of fruit juice in a small bowl until dissolved. Add the cornstarch and fruit juice mixture to the boiling mixture in the saucepan. Allow it to cook until the solution thickens. Stir in 2 tbsp. corn syrup and bring to a boil. Allow the mixture to cool, and then drizzle it on the fruit.